The Flying Rowboat - The Works of Joe Campolo Jr. Some of my friends and relatives (my wife being one) have commented at one time or another, that everything happens to me. While I disagree with that in whole, I will admit that I have had my share of mishaps and misadventures over time. As recently as just last week I had another small adventure which caused my wife to raise the contention again. 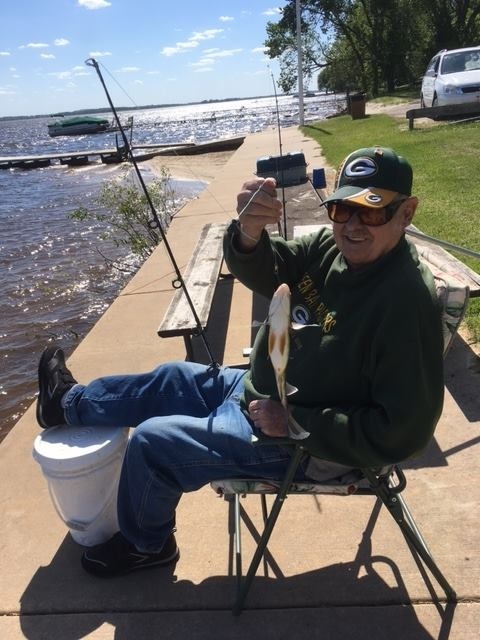 I was up at our mobile home on Lake Puckaway where I spent a couple of days doing a little fishing. I fished with two long-time friends from up there; my next door neighbor Art and my down the road neighbor Ken. 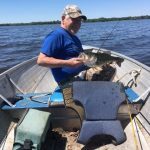 In the short time while there, we caught some nice fish…..and I added to my previously mentioned legacy of mishap and misadventure. 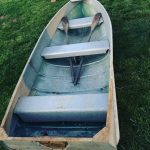 It started one early morning when I took my small motor boat out of its winter cocoon and readied it for action. When tested, the motor started up nicely so I took it down to the lake for a small shake- down cruise. The trolling motor battery wasn’t fully charged but I wasn’t concerned since I only planned on taking a short little jaunt. 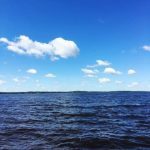 Once in the water, the motor started right up again and since it was such a nice day I decided to venture across the lake to a small bay where I might take a few casts for northern pike, bass or walleye. About three quarters of the way over, however, the motor died. I pulled and pulled on the starter chord; choke open, choke closed, throttle wide open, throttle closed…to no avail. Now looking at the trolling motor which had no power because the battery was back at the shed getting charged, I called my self a few unpleasant names and determined my options. Being a sparsely populated area there were no other boaters around to give me a tow. Well…nothing to do now but start rowing. I was probably about two miles from the boat launch as the crow flies. Rowing back across the lake was pleasant and a nice little workout…until the wind came up. Lake Puckaway is an East/West lake and the prevailing western winds usually kick up mid-morning; just when I had almost made it across the lake. 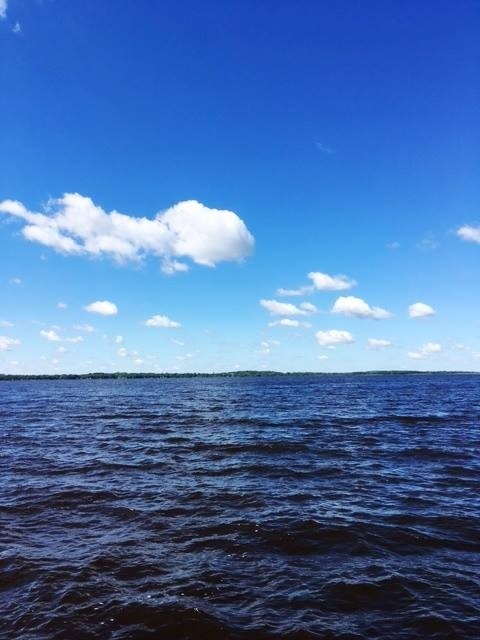 Now; fighting the weight of the gas motor, gear and the fifteen to twenty mile an hour wind, I was soon blown another two or three miles east of the boat launch. It then took me almost two hours, plus a considerable amount of grunt work to get back to the launch where I had started. 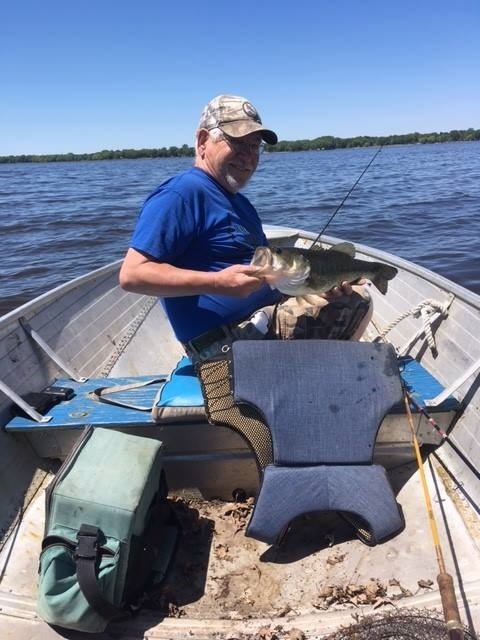 Ken with a nice Puckaway bass. After taking a breather, I got my friend Ken, a retired mechanic, to look at the motor. 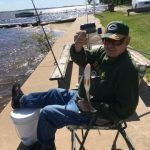 We found that the gas line had not been completely engaged to the motor fitting and once corrected it started right up and the remaining day fishing on good old Lake Puckaway was great. Between the three hours of rowing and the rest of the day of fishing I slept great that night! While rowing back to the launch earlier in the day, I had plenty of time to daydream. While doing so, I recalled a fishing trip several years earlier that Art and I had taken to the Grand River Marsh on the other side of the lake. We had taken my small rowboat as the pond was restricted to rowboats or boats with electric trolling motors only. Leaving early in the morning, we hitched up the boat and drove to the other side. When we got close to the area where we would access the pond we hit a large bump in the small road. We heard a large bang and looking in the rear view mirror I was stunned to see my small rowboat, tethered by only the winch rope, float off of the trailer and up in the air. Stopping suddenly would have caused the boat to come crashing down on the black top so I tried slowing down little by little. Art had now turned around in his seat and we both watched in amazement as the boat hovered above us like a large metal kite. And although I had only slowed down slightly, within less than a minute gravity took over and the boat slammed down on the black top with a huge bang, after which it rolled several times into a ditch. We stopped, pulled the boat out of the ditch and checked it for damage. Who knew they could fly? Somewhat flustered I realized that I had not secured the back of the boat to the trailer that morning. The only thing holding it to the trailer was the winch rope, and after hitting the large bump in the road, the trip lever jumped allowing the rope to play out, after which the wind got underneath the boat and floated it off and up. Smarting from my folly, I tied the boat down securely in several places before leaving. When Art and I got to the pond, we inspected the boat very carefully before sliding it into the water, and once in the water, we watched closely for any leaks. Having not found one drop of water inside the boat we spent the rest of the day on the water, nice and dry. To this day I still have that small rowboat and although it sits idle most of the time, playing second fiddle to the larger motor boat, it stands ready to go out on a moment’s notice, to fish….or to fly!